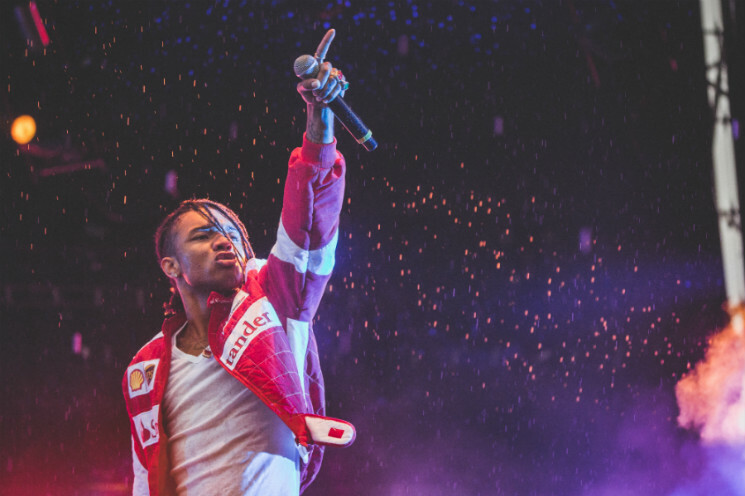 Rae Sremmurd concerts have been known to get a little wild, but the group's Swae Lee wasn't laughing when he required stitches after being hit in the face by a cellphone during a performance last night (August 26). Footage from the duo's show in Dallas last night shows the duo gearing up to launch into "Powerglide" before Swae Lee gets the DJ to cut the music. Additional angles then show him bleeding from the mouth, visibly upset and threatening to sue the fan who tossed the device. After he returned to the stage to finish the show, Swae Lee took to Twitter confirming that he received medical attention, adding that the remaining appearances on the "Dazed & Blazed Tour" would not be cancelled. Earlier this month, a woman went viral after she threw her cellphone onstage at a Drake concert, which led to the star picking up the device and hamming it up for the front-facing camera.